One of the most famous colored diamonds in the world is the Hope diamond, a natural color Fancy dark grayish blue diamond. The Hope diamond was graded in 1988 by a team of GIA gemologists. Photo by Robert Weldon © GIA. Courtesy of Smithsonian Institution. NEW YORK, NY – Aug. 1, 2018 – Blue diamonds, among the rarest of all colored diamonds, form at extreme depths – approximately four times deeper than most diamonds – and may get their color from a surprising source: the element boron, contained in the floors of ancient oceans carried deep into the Earth’s mantle by the movement of tectonic plates, according to new research featured on the cover of Nature, a distinguished international scientific journal. This was the first study to examine and identify the mineral inclusions in very rare and valuable blue diamonds. Analyzing those inclusions demonstrated that the diamonds formed at great depth in the presence of sunken, or “subducted,” ancient oceanic tectonic plates. 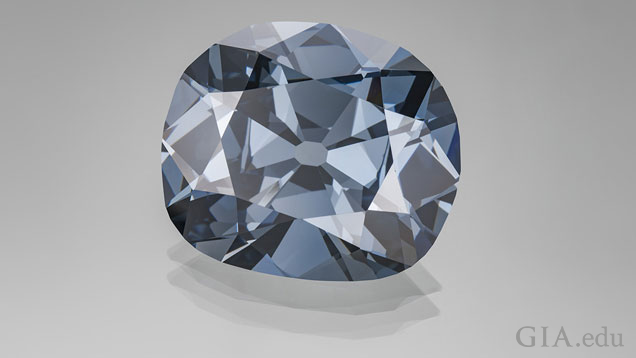 Blue diamonds, also known as type IIb diamonds, derive their color from minute quantities of boron. The study reveals that blue diamonds originate from depths reaching 410 miles (660 km) or more into the Earth’s lower mantle, where boron is scarce. Mineral inclusions in the blue diamonds show that they formed in deeply-subducted oceanic plates. The authors of the study hypothesize that the boron which causes the diamonds’ blue color may have originated in ancient sea floors that were transported into the interior of the Earth. This is scientifically important because it shows how elements, such as boron, from the surface of the Earth can be recycled deep into the mantle by plate tectonics. Smith and other researchers from the Carnegie Institution, the University of Cape Town (South Africa) and the University of Padova (Italy) used a variety of analytical techniques to examine the mineral inclusions in 46 blue diamonds submitted to GIA for identification and grading over a two year period. Nonprofit, independent GIA is the global leader in gem research, education, and laboratory identification and grading services. In addition to insight into the nature of some of the rarest diamonds known, this study also provided further clues to the elemental forces that formed the Earth, including our understanding of mantle geochemistry and plate tectonic processes. An extended abstract of the paper is available on GIA.edu. The paper is available from Nature. Smith is a research scientist at GIA. His research focus is diamond geology; he was the lead author of a December 2016 article in Science magazine on the origins of diamonds of exceptional size and quality. Smith holds a Ph.D. in geology from the University of British Columbia; he joined GIA in 2015 as part of a postdoctoral research fellowship program named in honor of GIA’s second president Richard T. Liddicoat, known as the Father of Modern Gemology. He will present the research at GIA’s International Gemological Symposium, Oct. 7-9 in Carlsbad, CA. For more information on the program and to register, visit symposium.GIA.edu.